I’m looking at driving now , that’s why I bought a Sunday ticket that way I can watch cricket and sober up at same time. Then drive home after it. That relies on not drinking on the Sunday we thought about it but combination of holidays, going down to TB for the ODI v Pakistan and ticket cost (we could only get the new stand at Headingly) we decided just to travel home on the Sunday. Third Test, day three, St Lucia has been good for England. Lead by 360 with 7 wickets standing. Sadly Keemo Paul & D Bravo are hurt. When to declare? Are Scotland ever likely to be a Test team? A quintessentially British sport, only fitting it has a healthy following of bears. Didn’t get it at all when I was younger but it’s probably my second favourite sport now. Great game in all formats. Got tickets for the third and fourth days at the Ashes test in August. Also got T20 tickets for the Roses match. Been going for the last few years. Headingley is a great atmosphere. Root declared agai st WI and they chased down a healthy score not so long ago in England didn’t he? Imagine the game is well beyond WI already but reckon England will bat at least some of the morning session tomorrow just in case. England playing test match in Ireland in summer. Ireland a test team since 22/6/2017. Scotland play Afghanistan in two One Day Internationals at the Grange in Edinburgh on Wednesday, 8th May and Friday, 10th May. A good way to see a first game of cricket if anyone is interested. Afghanistan are a full test side. Was there a couple of years ago for the same fixtures. Great atmosphere. The Afghanistan crowd know how to make a noise! A good way to see your first game of cricket. Afghanistan are a full test side. Was there a couple of years ago for the same fixtures. Great atmosphere. The Afghanistan crowd know how to make a noise! Playing Sri Lanka as well picked up a few tickets for the Saturday game. Ireland got there on a golden generation they’ll struggle badly again at that level and Scotland have improved massively over that past 2-3 years again. Unfortunately the ICC have blocked almost any progress now. Ireland got Test Status in 2017. I was actually thinking about going to their first ever test against Pakistan, seemed a great day out. I've only started getting into Cricket in the last few years. Can't abide by T20 mind you, it's the nuances and complexities of the Test game gets me. Had read the ICC were more or less closing shop on international cricket. Pleased Ireland got their test status but agree they’ll struggle. Afghanistan unearthing some talent but worry the money in T20 May harm their test performances. The ICC (India if we’re being honest) are in danger of killing the growth in the game with their antics. Scotland’s last attempt at qualifying for 50-over finals was the perfect example. "Shankill Protestant Boys" banner, with RFC crest, on display today. 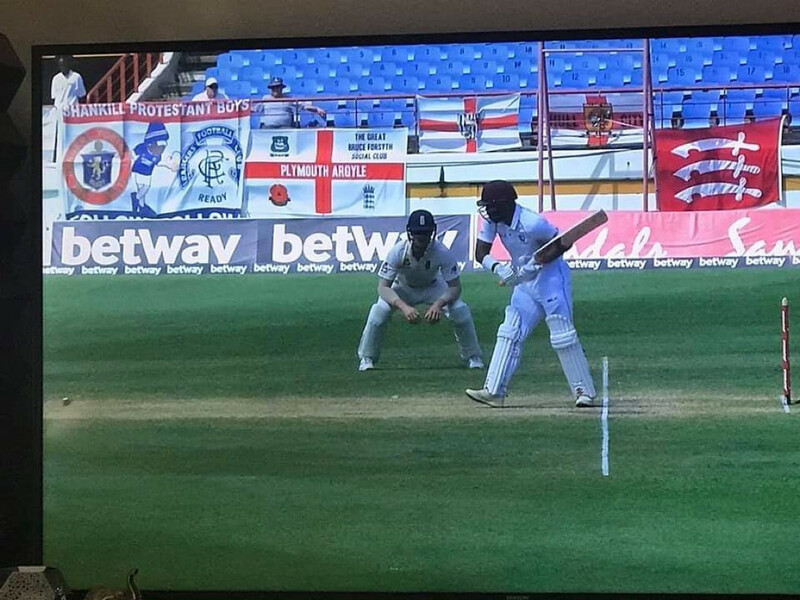 Clearly a good few Bears out in the sunny Caribbean enjoying the cricket. I went to Durham a few years ago for a day's play in the Ashes match. Great atmosphere and great cricket. The speed of the ball and the distance back to the keeper is amazing. Saw Peterson scoring a quick 50. We are attempting a day's play at Old Trafford this year. Met a good few bears at the bar! You always meet a good few Bears at the cricket mate. Particularly Headingley and Old Trafford.